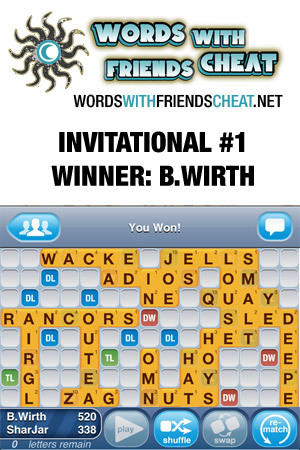 For Immediate Release – (March 11, 2011) Words With Friends Cheat is pleased to announce the final results of the inaugural Words With Friends Cheat Invitational. After months of accepting registration from over 400 players, the tournament began on February 6, 2012. The final matchup was between players B.Wirth and SharJar. In a contentious battle, B.Wirth defeated SharJar 520 to 338. For his efforts, B.Wirth will receive the First Place Prize Package. Runner-up contestant, SharJar made it through six matches to make the finals before losing a match. Throughout the tournament, Words With Friends Cheat challenged its participants to utilize their word generator to play the highest point value words they could find. The logic behind this tournament was that it is impossible to prevent people from using cheat sites to enhance their game, so why not take away that advantage by encouraging everyone to use it, and effectively level the playing field? The highest played word during the Words With Friends Cheat Invitational Tournament, was RHIZOID. BlackStar269 submitted the word during a third round match and was able to land 165 points in the process. For playing RHIZOID for 165 points, BlackStar169 has been awarded the Highest Word Play Prize. This tournament was a great opportunity to see how players interacted in an invitational type of format. Interested players can register for the next tournament at www.wordswithfriendscheat.net. Words With Friends continues to attract legions of fans daily and as the game evolves, so will Words With Friends Cheat. For more information on Words With Friends Cheat, please visit: www.wordswithfriendscheat.net.